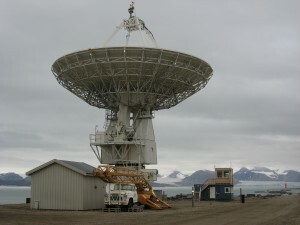 This antenna registers celestial radio sources like quasars. These quasars send irregular signals and by comparing a world wide network of antenna's pointing at the same qusars, they can register time difference in the signal at different locations on earth. This can be translated into distances to an accuracy of 3 mm. They also note small changes in the earth rotation when e.g. watermasses move over the globe.